Good afternoon ladies and gentlemen. It is an honor to stand before you today. I am the proud Chairman of CADA-Encouraging Responsible Alcohol Behavior. CADA has been in existence for 35 years and as an organization we continue to address the challenges of alcohol misuse and abuse in Bermuda. There are three things I would like to talk with you about today. 1. Personal responsibility when it comes to drinking and driving. 3. CADA’s new look and feel. Last week we held our annual Proclamation Ceremony on the steps of City Hall. In the past we have had such props as badly damaged cars in front of the podium to reinforce the end result of drinking and driving. This year we went one step further and had caskets lain out, representing the 70% of the 17 people who died on our roads last year. Statistics show that in 70% of all road fatalities alcohol and or drugs were involved. When we came up with the idea of the caskets there were people we talked to who were very uncomfortable with the idea. We have to be uncomfortable with the idea that our citizens are dying in unprecedented numbers on our roads. I have said in the past, if 17 people died at one time in Bermuda there would be a public outcry so long and loud we would be forced as a nation to confront the behavior. I believe because these accidents happen over the period of 12 months we are stunned and shocked until the next one occurs. I have to ask have we become desensitized to the carnage that is taking place on our roads? Are we immune when we hear of another young man who will no longer walk among us and contribute to our society? Are we deaf to the pleas of CADA and our partners asking our residents not to drink and drive? I believe that many of us do take personal responsibility to heart and know that if we are planning to drink alcohol we will find alternatives to driving. I believe that we are always acutely conscious that our actions directly impact on others. With this in mind, I will ask you to help the next person you see who has been drinking and is going to be reckless enough to drive or ride, we have a responsibility to take their keys, call a cab or simply take them home. If all else fails, call the police. It is best the person is stopped at all costs rather than to have them die in a senseless and purely preventable drinking and driving accident. On many occasions in the past I have talked about the numbers of people who been killed on our roads. Between 2006 and 2008, 42 people died on our roads in Bermuda. So far this year, we have recorded five fatalities. Every day we must make a decision, as a community, as a family and as an individual to help find ways to put an end to these senseless deaths. We cannot accept 22 deaths in 16 months with any level of comfort. It has to make us uncomfortable enough to continue to look for alternatives and through this discomfort we can come together and say enough is enough and do something concrete. We must look at our own behavior and in this process, we each must make a commitment to not drink and drive. EVER. A few weeks ago CADA received a call from a lady enquiring about securing safe transportation home for her and her friends after her birthday party. She was initially interested in us CADA’s Let Us Drive service which operates every Friday night but we had to inform her that Let Us Drive currently operates only from 3:15am-3:45am. However, we were able to direct her to one of the local taxi companies which subsequently arranged for three taxis to be in place at the end of her birthday party to take her and her guests home, for a prearranged price. THAT’S … TAKING PERSONAL RESPONSIBILITY. There are many, many examples and stories of people taking responsibility for their actions. There are numerous other ways to take personal responsibility. I welcome your stories. Send me an email at CADA and share your story of personal responsibility. CADA remains busy and committed to providing programs that address alcohol abuse and misuse. In 2008, through the TIPS program CADA trained 201 bartenders, alcohol servers and managers from 61 establishments around the Island. So far this year, CADA has trained 102 people. We have more training sessions planned throughout the year. Our mission is to train every single person responsible for selling and serving alcohol in Bermuda. We know this program gives those who have been through the training the tools to help patrons who have been drinking too much, teaches the alcohol servers how to cut people off and how to help them get home safely. Over the next few months you will hear and see advertising as we begin to educate the general public about the TIPS program so they will know what to expect when they go into establishments whose staff have been TIPS trained. An example of TIPS in action is patrons will be asked for identification to prove they are over 18. If they don’t have valid identification they will not be served alcohol. Another service proudly provided by CADA is Let Us Drive. As I mentioned a few minutes ago it is a free taxi service that takes people home on Friday nights. The taxis operate from outside of the LOM Building. Since its inception in May 2007, Let Us Drive has taken almost 2,500 people home. Last year the service provided free transportation to almost 1,500 people and for the first three months of this year almost 500 passengers have gotten home safely. I would now like to turn to the work CADA is doing with children. In 2008, almost 100 of Bermuda’s children aged between 6yrs old and 11yrs old, completed CADA’s eight week life skills program. The objective of this program is to increase the social, emotional and life skills of children and develop their character, thereby reducing the likelihood that they will feel the need to become users of alcohol or drugs. I mentioned at the beginning of my talk personal responsibility in reducing underage drinking. As we think about our children we have to recognize that we also have a responsibility to reduce their access to alcohol. You may be shocked to learn that the average age of first use of alcohol in Bermuda was shown to be ten and a half years old. We have to find ways to increase the age children are first introduced to alcohol because the younger a person is when they begin drinking alcohol they are more likely to develop alcohol dependence (alcoholism). We also know that if a child is introduced to alcohol before the age of 15 they are four times more likely to develop alcohol dependence (alcoholism) than those who wait until the age of 21. Research shows that of the children who do consume alcohol, 65% say they get it from family members or friends. Personal responsibility dictates that we don’t allow children to drink from our glasses that contain alcohol. Nor should we deliberately give them a sip of beer. Beer is an alcoholic beverage. Personal responsibility dictates that we talk to our children about alcohol use and abuse and that we model appropriate positive alcohol consumption in front of our children by not getting drunk. Remember, they will grow up to do what they have seen us do. Personal responsibility also dictates that we don't keep alcohol in the house, or if we do, we keep it well out of reach. If you must keep alcohol in your house, keep it in a place that is high up and out of easy reach to your child, or even better lock away the alcohol. As an organization, CADA continues to grow and move from strength to strength. Through our refocused organizational view we made some changes at CADA and how we will be known by the public and our partners. The look you see today on the design of our tee shirts (I will give each of you one before you leave here today) is what will represent CADA for the foreseeable future. We are no longer the Centre for Alcohol and Drug Abuse Prevention. We will simply be known as CADA and our tagline is – Encouraging Responsible Alcohol Behavior. After doing brand research and development we created a tagline with a look and feel which, as a Board, we believe represents who we are becoming as an organization. So when you think CADA remember– Encouraging Responsible Alcohol Behavior. Let that sit with you for a few minutes – Encouraging Responsible Alcohol Behavior. That is what you see written immediately below the logo. We have a lot of activities planned for April – Alcohol Awareness Month. Tomorrow, April 8th we are hosting an Open House in our office in the Melbourne Building on the corner of Victoria and Parliament Streets. I invite you to join us from 3pm. We will be serving non alcoholic beverages and light refreshments. You will also have an opportunity to win a prize. We will conduct our annual Tag Day this week … it takes place on Thursday April 9th in and around Hamilton and then on Saturday April 11th we will be in various locations around Bermuda. When you see one of our taggers please feel free to make a generous donation. The money raised will be used to support the programs we have in place. I invite you to check out our revamped website at CADA.BM. You can learn about all the alcohol awareness month activities we have planned for April. Our personal responsibility when it comes to drinking and driving. I encourage you to become familiar with CADA’s new look and feel. As I said, we are now CADA, encouraging responsible alcohol behavior. Ladies and gentlemen as I prepare to end my speech, I have a number of people to thank. I would like to ask Gillian Freelove-Jones to stand. Gillian is the Executive Director, and is the entire staff body, of CADA. She does an outstanding job of putting on and organizing the programs we support. 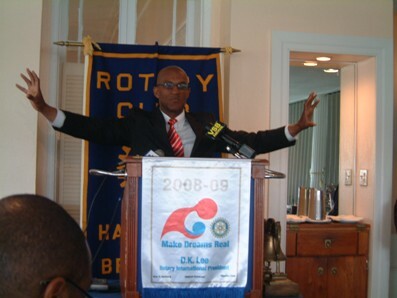 I have the honor of being the Chairman of the hardest working Board in Bermuda. We have been known to meet at 6:30am and 7:30am. That says total dedication to me. I would like to ask my fellow Board members to stand and be acknowledged. Thank you all. Thank you for your time, hospitality and generosity in allowing me to speak today and I encourage each of you to support another as we each take personal responsibility to eliminate drinking and driving in Bermuda. Don’t forget I have a free tee-shirt for each of you.